As I've observed in recent years, e-cigs are rudely ripping away the façade of respectability mendacious tobacco controllers have constructed around themselves. It really is incredibly fascinating to watch. 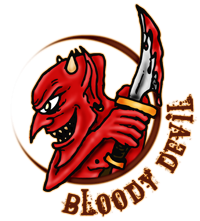 For over four decades now, a prime tactic of the global tobacco control industry Goliath has been deliberate cherry-picking of statistics in order to produce one-sided equations. From there, it is very simple to create a media-friendly sound bite to hoodwink policy-makers and most of the public. The most obvious of these is the claim that tobacco use in the UK (the same method is used in every country) 'costs' the NHS £2.7bn to £5bn whilst ignoring the official documented fact that government receipts from tobacco - which are not hypothecated so apply to NHS funding just the same - have always massively dwarfed costs. Tobacco control simply pretend duty receipts don't go in the same pot. Likewise, recently, it was loudly trumpeted by tobacco controllers everywhere that smoker prevalence in Australia had fallen "because of" plain packaging. It had fallen, yes, but only as one would expect from long term trends and certainly not directly as a result of plain packaging. At the same time, not a single one of them worldwide even murmured about the massive increase in daily youth smoking which occurred over the same time frame and was detailed in the very same statistical set they quoted from. This left one journalist recently scratching his head as to how he'd been deceived into publishing a blatant falsehood in the Irish Journal (he didn't correct it though) and, even while beginning to write this very article, a tobacco controller - like a cat refusing to believe a mirror image is real - was similarly trying to avoid admitting the inconvenient 36% increase to me on Twitter. The collection of anti-business sociologists, marketing wonks and ambulance chasers who comprise the tobacco control gravy train like to revel in the terms "expert" or - ha! - "scientist", but can you imagine a real scientist making calculations with one half of the equation missing? That spaceship wouldn't have landed on a comet, it would have more likely planted itself at high speed in the middle of Slough. Y'see, what happens when you ignore half of the evidence is that you don't get a true indication of the full picture. But tobacco control know this very well when they deliberately tweet 'lies by omission' like this. Of course, the 'public health' community piled in to re-tweet it, including such "experts" as anti-food hector Simon Capewell, an organisation which claims to spread "the truth about tobacco" and, naturally, geriatric ex-vandal turned Twitter troll Simon Chapman. Worst of all though, was a re-tweet from someone who works at the US Center for Disease Control (CDC). Because, via Jacob Sullum at Reason, she appears to be woefully ignorant of her own organisation's research! Yesterday the U.S. Centers for Disease Control and Prevention (CDC) released survey data that show cigarette smoking by teenagers continued to fall last year even as their use of electronic cigarettes continued to rise. 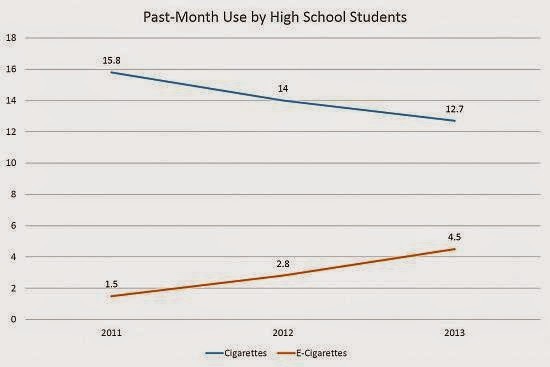 Between 2011 and 2013, according to the National Youth Tobacco Survey, the prevalence of "current" (past-month) cigarette smoking among high school students fell from 15.8 percent to 12.7 percent, while the prevalence of current e-cigarette use tripled from 1.5 percent to 4.5 percent. And this is what it looks like when you add the other side of the equation into a graph. Now, why is it that tobacco controllers - who always love to talk about decreases in smoking amongst all cohorts but most especially youths - seem to want to completely ignore this dramatic, easily-discoverable decline? Do you sense an agenda here? It is quite clear that e-cigs are a factor in that big decline in youth smoking in the USA, yet the pharma-compromised tobacco control industry are desperately trying to spin the opposite. Why? It's really not about health, people, believe me. Teenage smartphone use has gone up by over a thousand percent in the last ten years, and for exactly the same reason as the increase in e-cigs in the last four: because when you go back to those points in time, the product was very expensive and not very well known or widely available. Teenage driving deaths have skyrocketed since 1900, as have their parachuting deaths. It's a worldwide epidemic and no one is doing a damn thing about it while our children continue to die! As little as fifteen years ago there were ZERO deaths from energy drinks like Red Bull in Sweden. Last year the number had grown INFINITELY and stood at FOUR in that single year! The bloodbath has clearly reached Biblical proportions. On the Biblical front though, we are pleased to report a drastic decrease in the rate of crucifixions. No one is quite certain what has caused the drop, but it has been studied closely and been determined to be statistically significant. All eyes are on Rome however: if a plague of crosses breaks out again in the future, the Pope is expected to be Patient Zero. LOL! Yep! Guess it would Nor!